At each trumpeted reveal of Sir Richard Branson’s Virgin Voyages ship Scarlet Lady., Is set for a splashy 2020 launch in Miami — as the buzz builds and thrills start. The plans for the virgin cruise terminal show just the start of what will be the most and only adults only luxurious cruise ship in the world. The blueprints for this adults-only, 2,700-passenger brainstorm-at-sea have navigated a stylish vision toward playful vibes and youthful edginess. The announcement delivers much-anticipated news about what some of the staterooms will look like. :And, at least for the roomiest suites, the word rockstar is involved. The RockStar Suites are located top of ship. Branson, founder of the Virgin Group announced: “Virgin has always avoided stuffy formalities and brought a lot of excitement and a bit of rebelliousness to our customer experiences.” Among the 78 suites total, 15 are categorized as Mega “RockStar” (further differentiated into Massive Suite, Fab Suite, Posh Suite and Gorgeous Suite) and the remaining 63 expansive spaces are RockStar level (again divided into Brilliant Suite, Cheeky Corner Suite, Seriously Suite and Sweet Aft Suite). Master-minded by Tom Dixon’s Design Research Studio in London, the decor embraces a retro-futurism look with Dixon’s iconic architectural accents, such as iridescent dichroic glass. For many passengers (also known in Virgin Voyages’ vernacular as sailors), nighttime will be the right time. RockStar Suites spotlight a full bar and cocktail kit — with round one complimentary. There’s a vinyl turntable and premium bed linens. Plus, mood lighting, because…of course. The suite deals feature VIP RockStar perks: a personal assistant called a RockStar Coordinator; a wardrobe team to help passengers pack and unpack; complimentary clothes pressing and nightly swimsuit-drying service; and early access to on-board entertainment and restaurants. 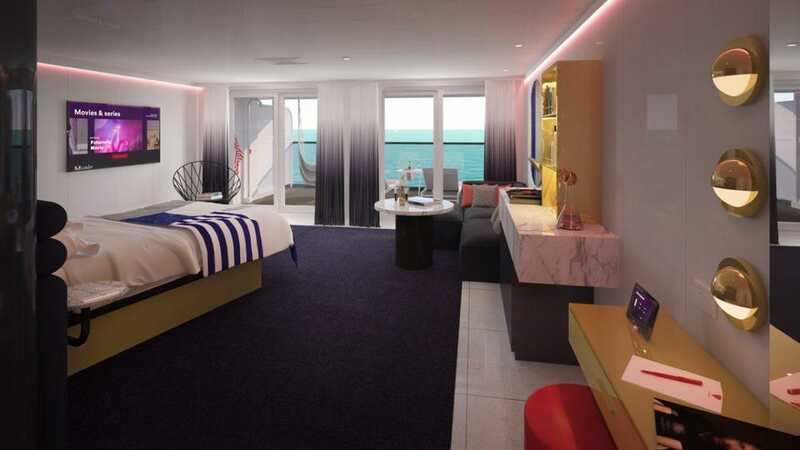 The Massive Suite’s terrace.© Virgin Voyages All RockStar Suites feature a European-style king bed. Anticipate a lot of champagne sipping, hammock hanging and dreamscape gazing. Other features include a catamaran-inspired “Athletic Club” lounge featuring the world’s largest daybed at sea. For VIP suite guests, “Richard’s Rooftop” (named after Branson) will be a private lounge area with large circular loungers and giant umbrellas. The VIP section was designed by Design Research Studio. A beautiful variety of sunbathing, relaxing and having a daytime cocktail. “The Dock,” by Roman and Williams design firm, on deck seven will also be a lounge area, featuring trees and daybeds, and focused on relaxation and socializing. The terrace garden is a special place too eat, mingle have a cold beverage and catch up on a good book. A“test kitchen” which looks like something you’d find on an episode of Masterchef. The design partners—which include Tom Dixon’s Design Research Studio in London, among other prestigious names—are reportedly drawing inspiration from trendy boutique hotels, rather than conventional cruise ships. No Maine dinning room and no all you can eat buffet. Clearly, when Scarlet Lady (the first ship in the adult-only Virgin Voyages fleet) sets sail from Port-Miami to the Caribbean in 2020, there’s every indication that it won’t be business as usual. In fact, veteran cruisers may be baffled by some of the one-eighty culinary deviations. Some of the standout dining options, among many that were announced for Scarlet Lady. Rendering of entrance to Pink Agave Mexican restaurant, designed by Tom Dixon. The decor in the Agave is bright with colors to amaze the eyes. Razzleurant, designed by Tom Dixon Dazzle, will offer an inventive twist on vegetarian and vegan fare with a juice bar; its eye-catching decor derives from the bold black and white camouflage used by ships during WWI. And it wouldn’t be Virgin without nightlife. The Manor, also by Roman and Williams, is named after Branson’s first ever Virgin music studio of the same name. The emerald, gold and dark purple club is expected to draw on Branson’s history in the music industry. A couple of weeks ago, Virgin Voyages raised eyebrows when it announced that it would house the first tattoo parlor at sea. This week, in another move to differentiate itself from the rest of the industry, Virgin Voyages announced the outlines of a bold culinary program for the Scarlet Lady. With so much luxury, glamour and glitz it would be a very Haute Vacation. Bon Voyage! !